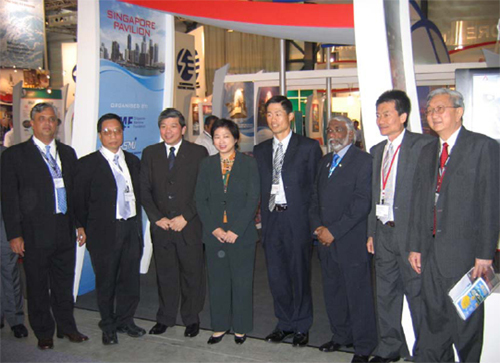 JTJB is once again proud to have been part of the Singapore delegation participating in the Nor-Shipping exhibition in Olso, held on 12-15 June 2007. The delegation was headed by Minister of State for Finance and Transport, Mrs. Lim Hwee Hwa. JTJB, represented by Dato’ Jude Benny and Danny Chua, was part of the Singapore pavilion which showcased the strength and depth of the Singapore maritime industry, and included companies such as Keppel Shipyard, Sembcorp Marine, Tru Marine, ST Marine, Eurasia Shipmanagement and Sinwa Limited. In conjunction with Nor-Shipping, a “Singapore Nite” was also organized so that guests of the Singapore exhibitors could come together for a night of Singapore food and drinks, and to network. JTJB’s participation in this exhibition provided an opportunity to strengthen old ties with existing Scandinavian and International clients, and to reaffirm its position as the leading maritime law firm in Singapore. JTJB’s active involvement and constant interaction with key maritime industry players in events such as the Nor-Shipping gives us a unique understanding of clients’ needs, and enables us to bring to clients the best practical solution to their problems.